The Kindle Fire HDX isn't your typical Android tablet, but it has largely been well-received by critics thus far and should make for an all around solid media consumption device. If you're already invested in Amazon's ecosystem, this is probably the best way to take advantage of it, for until Amazon drops an app for Instant Video into the Play Store, this is your only option for easily streaming those movies and TV shows to an Android tablet. The latest generation Kindle Fire is now ready to ship, so you can head over to Amazon right this moment and have a unit shipped your way today. 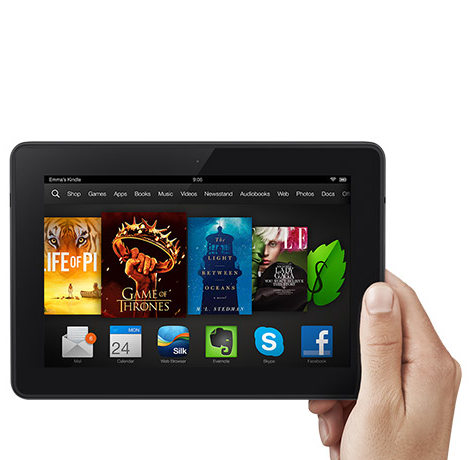 The Kindle Fire HDX comes in both 7" and 8.9" variations, but only the smaller option is currently shipping. This lightweight device has an attractive 1920 x 1200 323 ppi display, a 2.2GHz quad-core processor, and 2GB of RAM. It comes with either 16, 32, or 64GB of internal memory along with optional 4G LTE from AT&T or Verizon. Since this is a Kindle, you can get it with or without ads, depending on how much you're willing to spend. The lowest price offered is $229. Even if this isn't the ideal tablet for you, it may be a great item for someone you know. Its UI is already pretty straightforward, and there's a new "Mayday" button that brings an Amazon expert onto your screen who can draw on it to guide you around. And if that still isn't helpful enough, they can proceed to make changes for you remotely. The Kindle Fire HDX is a device that you don't actually have to learn how to use in order to, well, use it.